These are the best light conditions I could find for photographing the red-on-red pattern on the two side panels of my wall hanging. The late, low, winter sun was drifting in through my bedroom window and I looked up from my weft twining to discover how well the light and shadow brought out the relief pattern. I have posed these pieces all over the place…on the floor, on the table, in this room and that…used natural light and flash, held the camera in my hand, and used a tripod, and was not happy with any of the results. All I got was a flat red mass. And then, there I was, happily seated with my backstrap in place and the warp stretched out before me. The light came to me through the window and gave me the shot at last. It was great after all this time to be able to see how the red panels looked beside the center one. The tricky part was lining the three panels up precisely and have them suspended under the same amount of tension so that I could twine across the top of all three at the same time. I need to do a bit more solid black twining to finish. That will be the part that gets clamped within the wooden hanger. 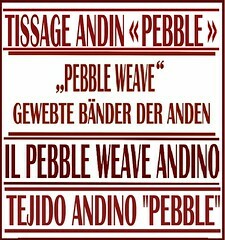 Once off the loom, I will decide how to finish the ends of the twined wefts and how I will cut the fringe around those long woven tabs at the other end (see below).I need to contemplate that for a while. Once cut, that will be that, and I want to get it right! So, it is time to move on to the next project….a clean slate and a bunch of sticks…exciting! I bought a large cone of UKI 20/2 cotton for the next project with which I have never woven before. 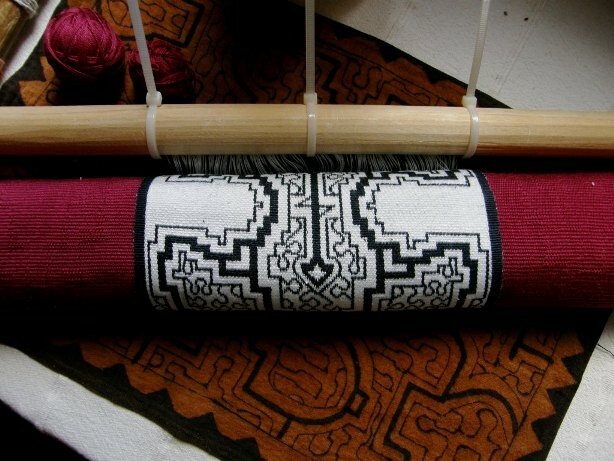 That means it is time to sample the yarn while I play with ideas for the ikat in the next wall hanging. I’ve been at the sketch book creating hooky designs. Whether I am creating a design that is way beyond my limited wrapping skills, remains to be seen. First, I need to get an idea of what kind of width I can get with X number of ends in the 20/2 cotton and so I wound a short-ish warp as a sample. 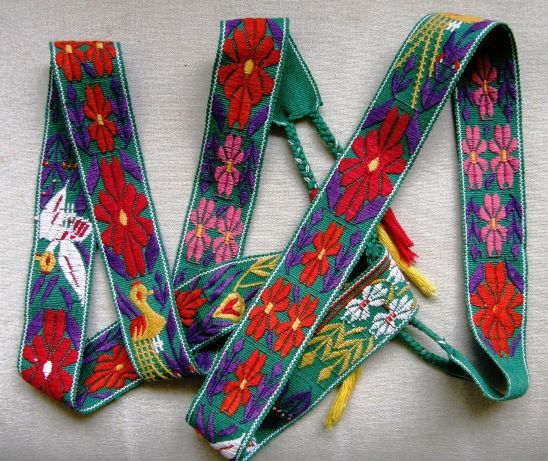 To make it more interesting, I decided that I could play a bit with the silk that I recently bought at CNCH and try a new-to-me supplementary-weft technique that is used for decorating hair sashes from Jacaltenango in Guatemala. 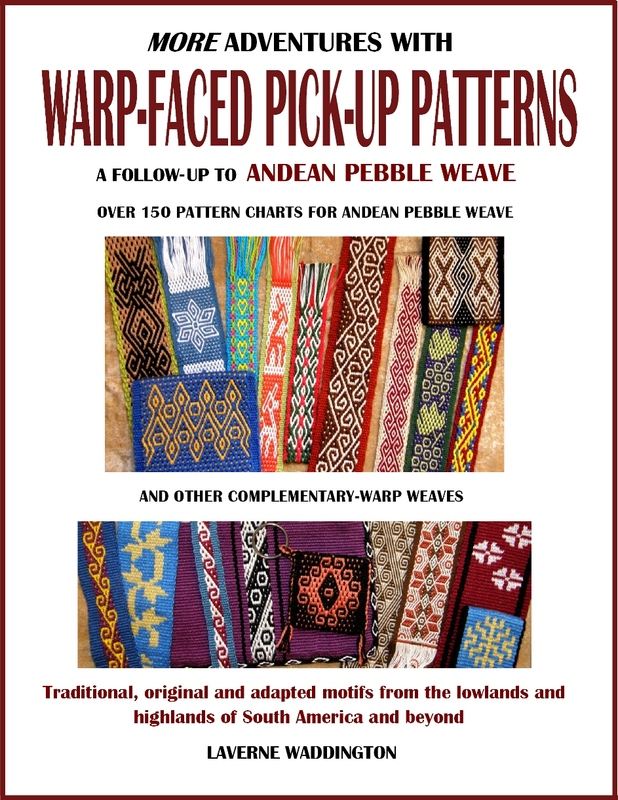 Dr Carol Ventura has written a book about the Jacaltenango hair sashes. I have owned this book for years and once dabbled with the technique many, many years ago. 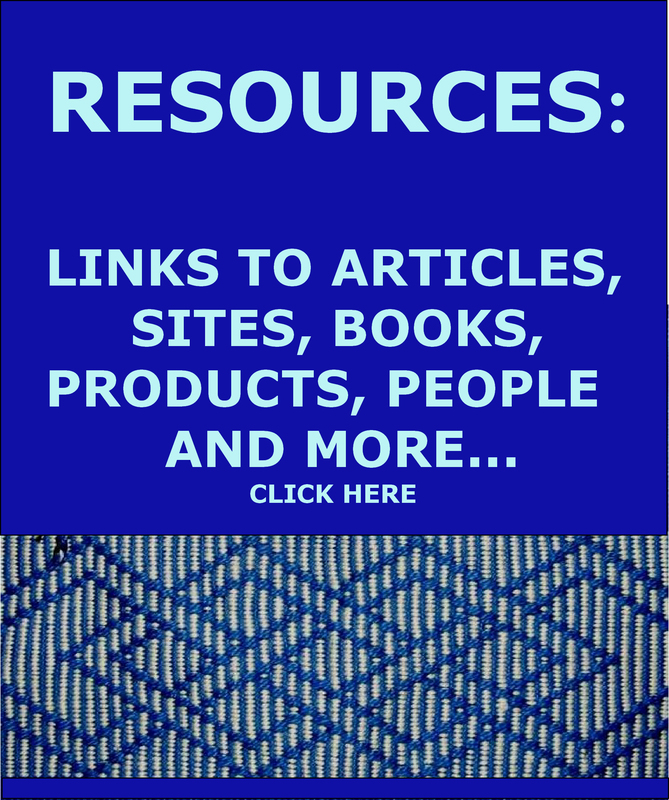 As is always the case when using supplemental weft, the success of the project is very much dependent on finding the right kind of material for the supplemental weft for the weight of the ground cloth. 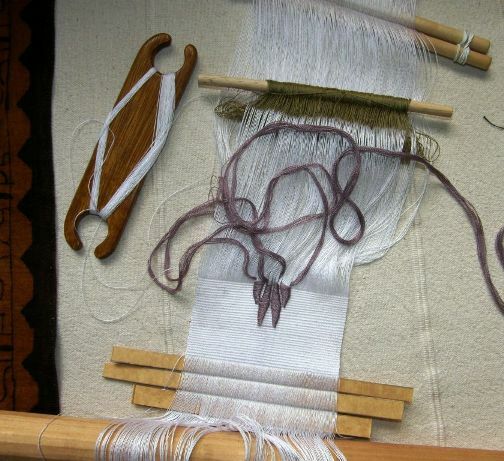 While I understood the technique, my sample was downright ugly because my supplemental weft was too “light” for the ground cloth and there were large gaps between the rows of pattern. Then, I got distracted and wandered off in another direction. I don’t even know where that sample is now. It was obviously not worth keeping. 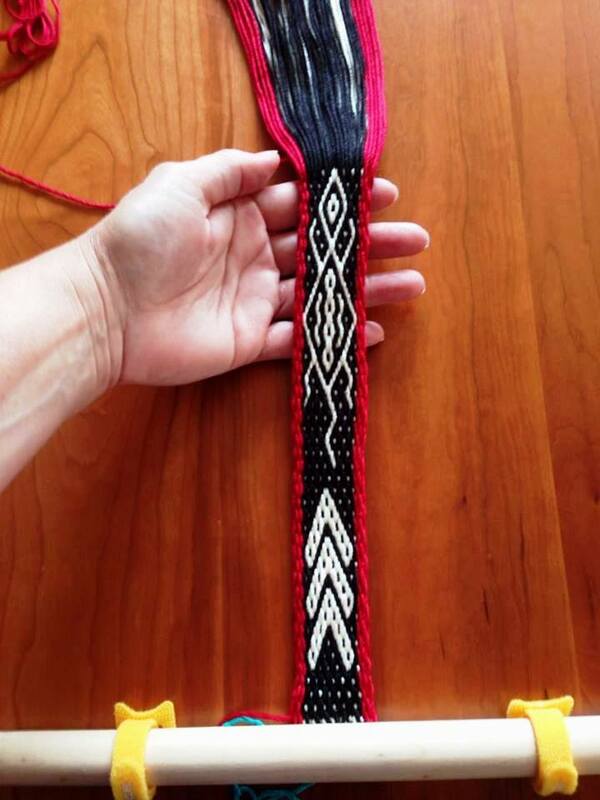 However, seeing a Jacaltenango hair sash that one of my students brought to class in Seattle last spring re-ignited my desire to try this technique…. I have made mistakes in my new sample and my count is off. I will un-weave this and start again now that I have a better feel for handling and counting these fine warp threads. Hopefully the next attempt will be better. In the meantime, this 20/2 white sample will give me a good idea of how many ends I will need to wind for my next wall hanging panel. I like two-fers. And finally, this experiment involved dyeing and then removing some of the wraps to dye again for a second color. 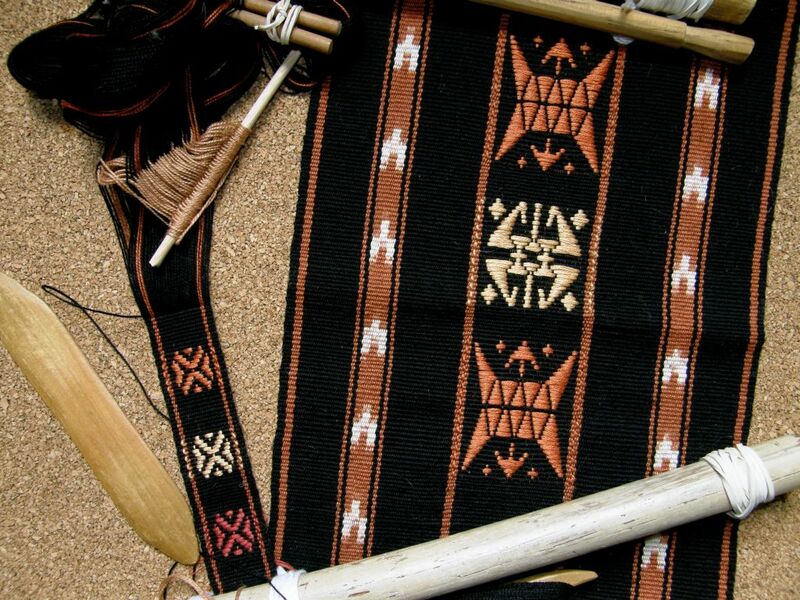 Way back in 1998, my weaving teacher in Candelaria, Bolivia showed me the first piece of ikat I had ever been able to handle. It was a bedspread on which she had been working on and off for several years. 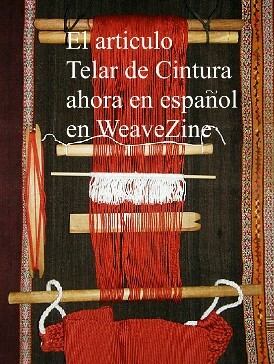 This was something she was weaving for herself rather than the usual pieces that she weaves for the store in the museum in Sucre. She was weaving with rather coarse handspun wool and her name and her husband’s had been worked in amongst the flower motifs..
I’ve examined the wrapped warps, the finished cloth, and watched the weavers at work in many different places in my travels in South and Central America, trying to capture the secret of limiting the amount of movement of the warp threads and the resulting image distortion. 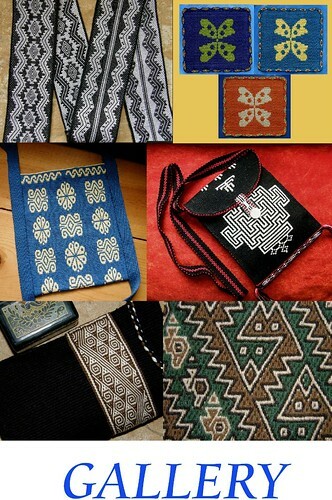 Below are examples from Chile, Ecuador and Peru. So, that is what I have been up to this last week…. Meanwhile, there has been a fair bit of red, black and white appearing online in the various places where band weavers hang out. 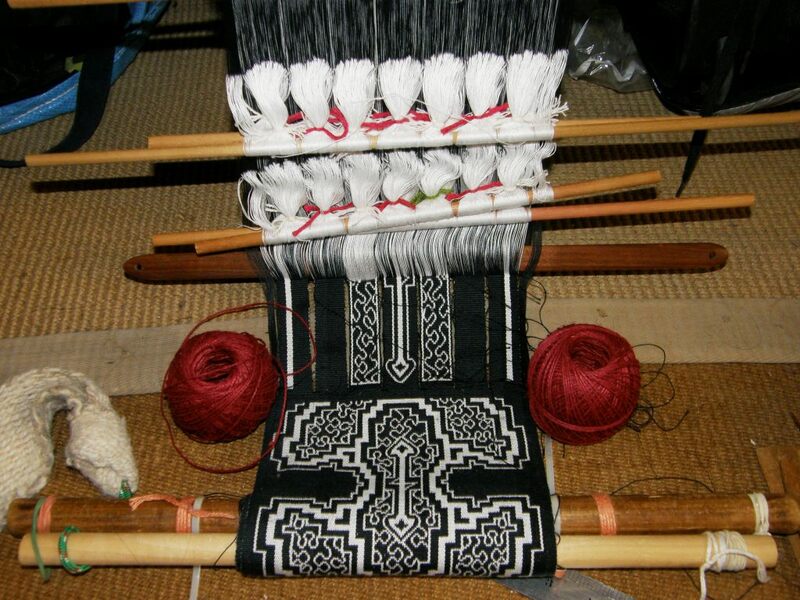 Cheryl wove with me last spring and now she is already designing her own motifs and weaving more than just samples. 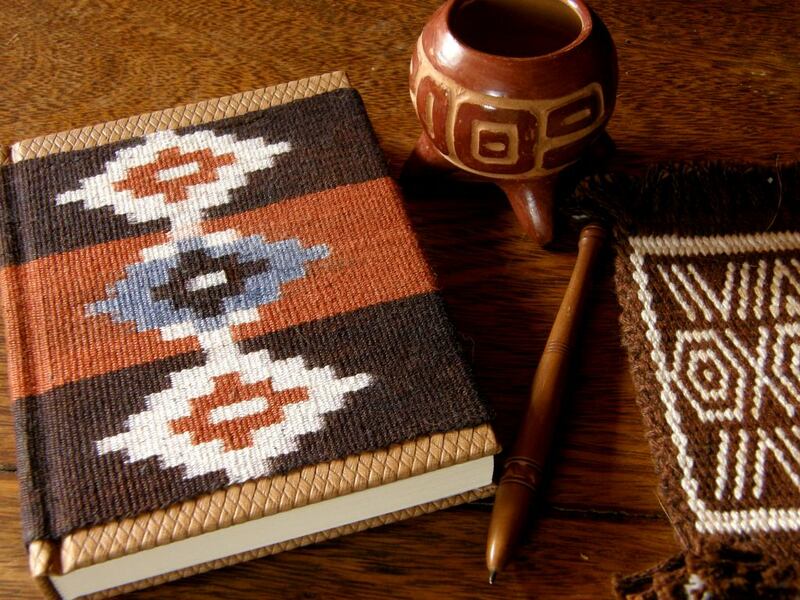 The center motif is charted in my second book and is a pattern that I adapted from tablet-woven band by Louise Ström. 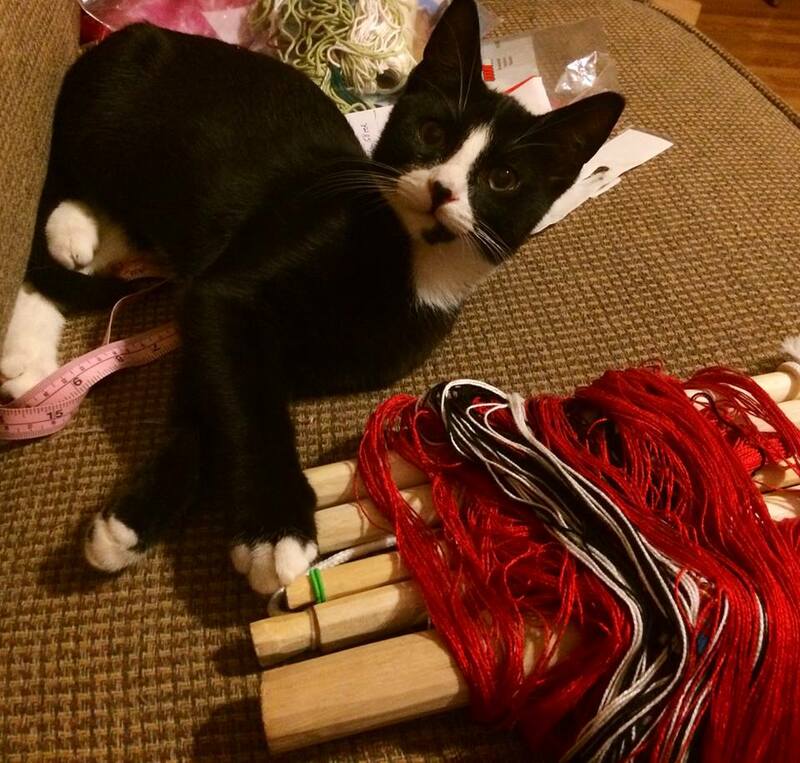 Rufio, the kitten (who would look very stylish with a red collar) was rescued from Pet Rescue of Mercer. And, if you are wondering about what I call “simple warp floats, the technique that I used on the red-on-red panels, Susan Anderson’s example. above, very clearly shows the single-faced nature of this pick-up technique. 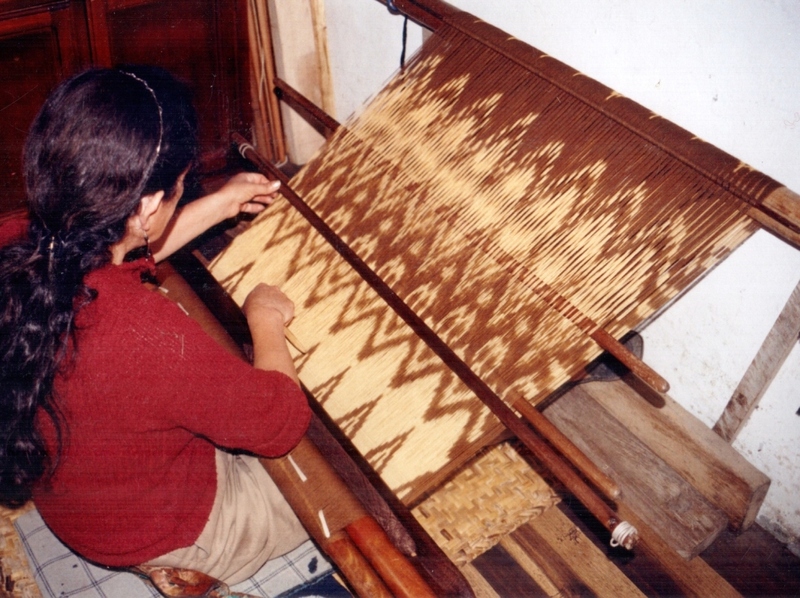 Susan has floated the warp threads singly. 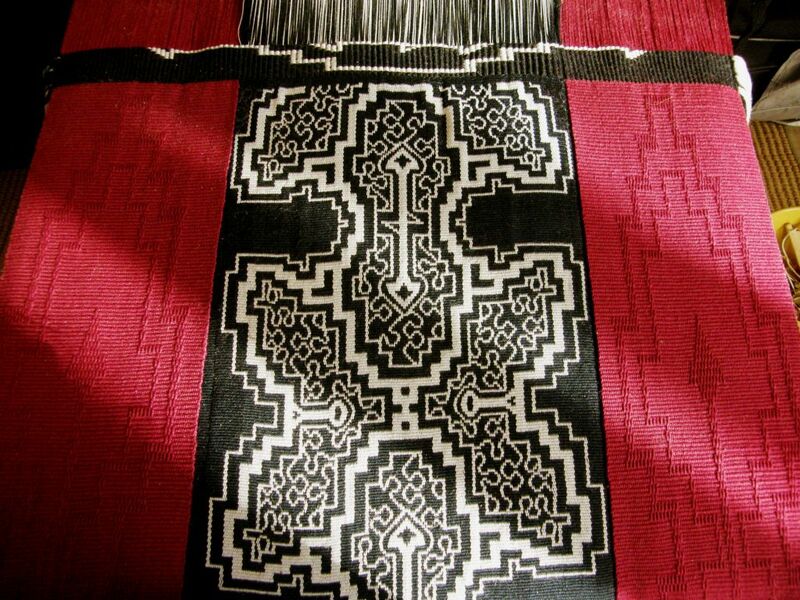 For me, this gives a more delicate yet solid look to the motifs than that which is achieved by floating pairs. 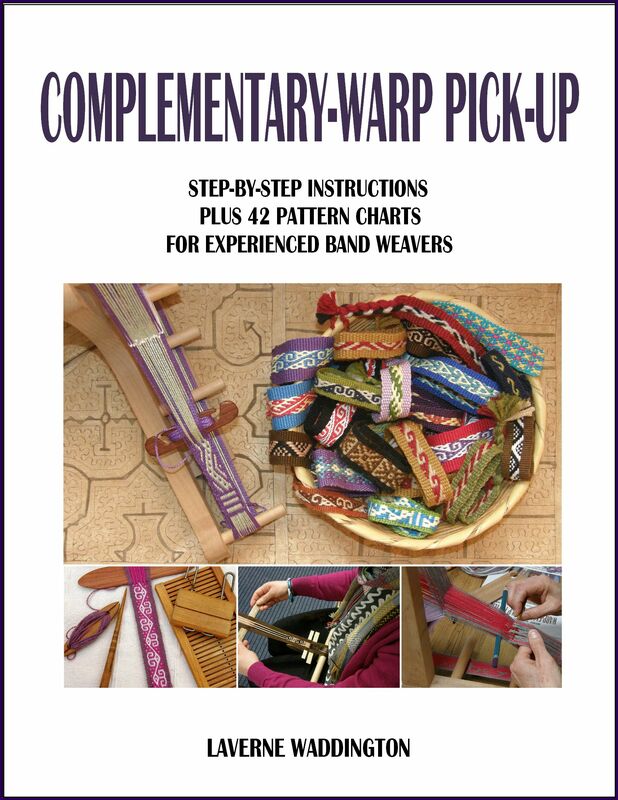 The pattern is from Anne Dixon’s The Weaver’s Inkle Pattern Directory. 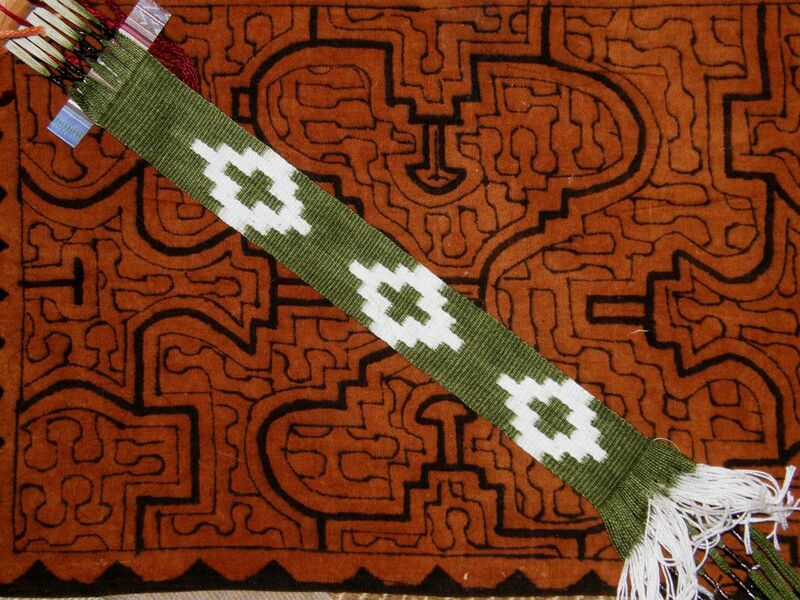 Susan wove this on an inkle loom and has done a beautiful job. This was my first ever attempt, around eight years ago, I would guess. 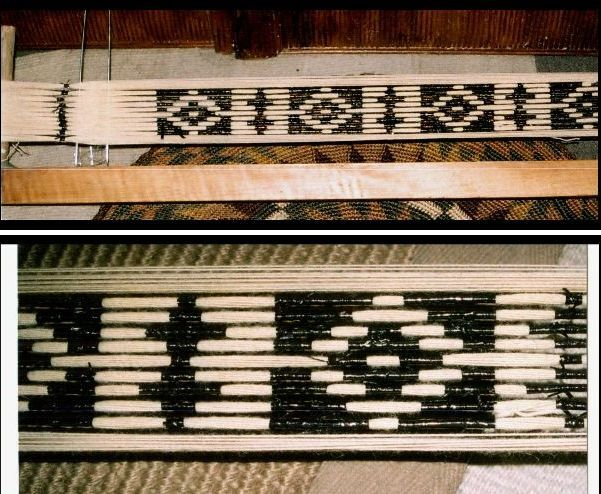 It’s wool warp…Navajo warp…wrapped with cassette tape. 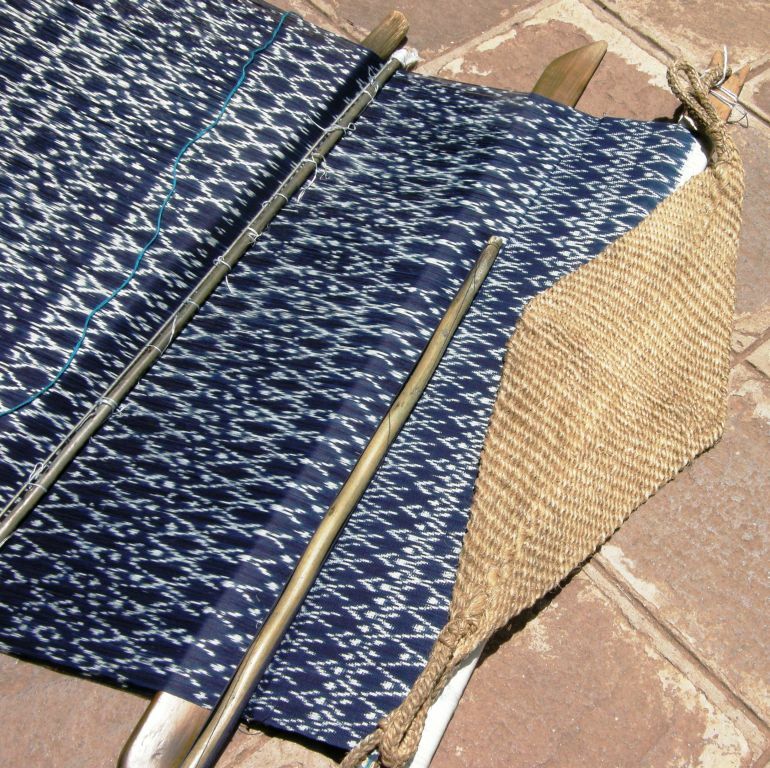 The wrapping and dyeing were successful…the weaving was not! This is another sample that has disappeared!…nothing to show for those hours of work except this picture and “experience”. And I am sure that there will be much more experience to be gained and many more lessons to be learned in this coming week. Thank you, Ingrid! I plan to do the same with the next one…plain red panels next to a patterned center. How did you create the relief pattern in the red side panels? 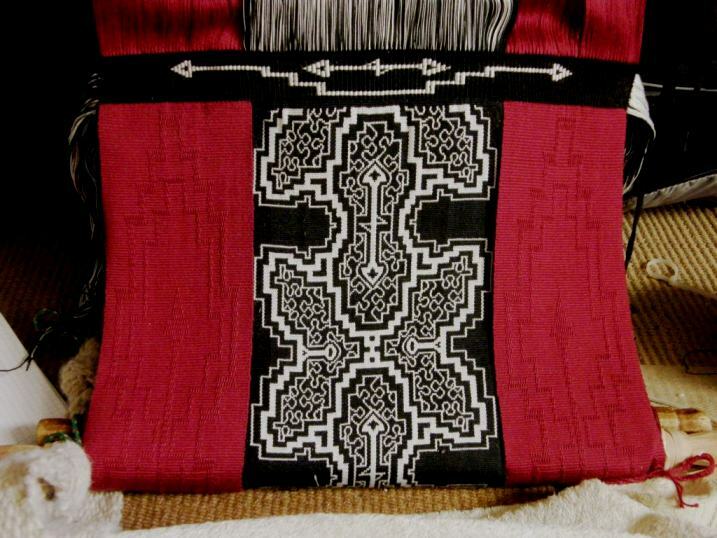 I know how to do that with card weaving but not backstrap. It’s beautiful! Thank you. 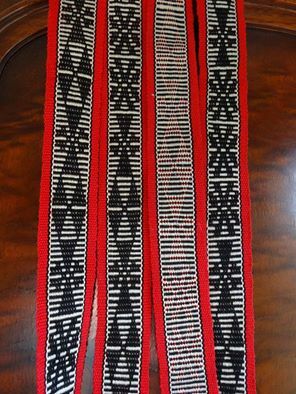 They are warp-floats, Keith…three-span floats on one side of the fabric.It is exactly what Susan did in her inkle band (see the last picture in the post) except that my warp is all red and hers is black and white. Very beautiful and the lighting is perfect. If you wait long enough, it will come! I vote for the side with the black background. Thank you, Alice. I’ve decided that I like the dark side better too. Just as well, as it fits better with the other pieces that way. Gracias Teresa. Espero que el libro te guste.